Bus from Singapore to Melaka (Malacca) is one of the favourite routes for locals, visitors and tourists because of Melaka’s historical sites and its distinctive and scrumptious local food and Nyonya food. Since Melaka was listed as a UNESCO world heritage site in July 2008, more tourists are flocking to Melaka to experience the city. There is no airport or train station in Melaka city, hence the only transportation mode is by bus from Singapore to Melaka. Delima Express, KKKL Express and 707 are the top favourites for Malaysians who stay and work in Singapore. They usually travel by bus from Singapore to Melaka on Friday nights and come back by bus from Melaka to Singapore on Sunday afternoons. They often spend a weekend at hometown Melaka with their families. Buses for the route from Singapore to Melaka generally depart from City Plaza (Payar Lebar MRT), Boon Lay, Queen Street, Orchard Road, Golden Mile Complex and many other places. They provide direct buses from Singapore to Melaka which usually takes about 4 hours depending on traffic conditions. Washroom breaks will be provided upon request. The fare for the bus from Singapore to Melaka terminating at Melaka Sentral ranges from SGD 20.00 – SGD 36.00, depending on the coach company. Standard fare is usually around SGD 23 to SGD 25 unless there is a special promotion. These coaches terminate at Melaka Sentral, an integrated transportation hub in Melaka. Melaka Sentral is about 10 minutes driving distance away from Melaka city centre. Taxi is available to fetch you to the city centre at the cost of around RM20-RM25. As for local Singaporeans, they like to spend a great weekend in Melaka for the food and historical sites. They prefer to take coaches from WTS, Luxury Coach and Grassland Express because these buses usually stop at major hotels in Melaka such as Equatorial Hotel, Hatten Hotel, Mahkota Hotel etc. These hotels are located in Melaka city centre and they are within walking distance from major attractions. However, the bus fare is usually higher ranging from SGD 30 – SGD 40 for WTS, Luxury Coach, and Grassland because better services are provided to bring passengers directly to hotels without the need to take a taxi from Melaka Sentral to the city centre. Interested to go Melaka for a short vacation? 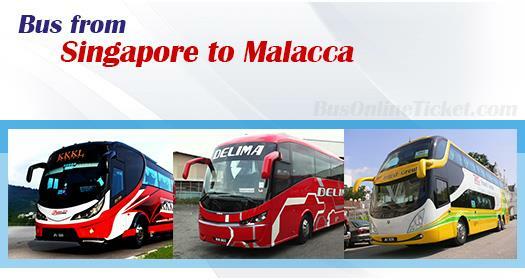 Please visit BusOnlineTicket.com to make your booking online and get instant confirmation for your ticket for a bus from Singapore to Melaka. BusOnlineTicket.com, the largest bus ticketing portal in Malaysia and Singapore, has almost all the bus choices available in the market for you to choose from. Thus, this provides convenience for customers to book tickets online instead of needing to physcially go to a counter, just to buy a ticket.